Last month, HRC presented two child welfare agencies from Texas with the All Children – All Families (ACAF) Seal of Recognition at HRC Foundation’s third annual Time to Thrive conference. The ACAF Seal of Recognition is awarded to agencies that have exemplified a commitment to compassionate and competent care of LGBTQ youth and/or families in the child welfare system. 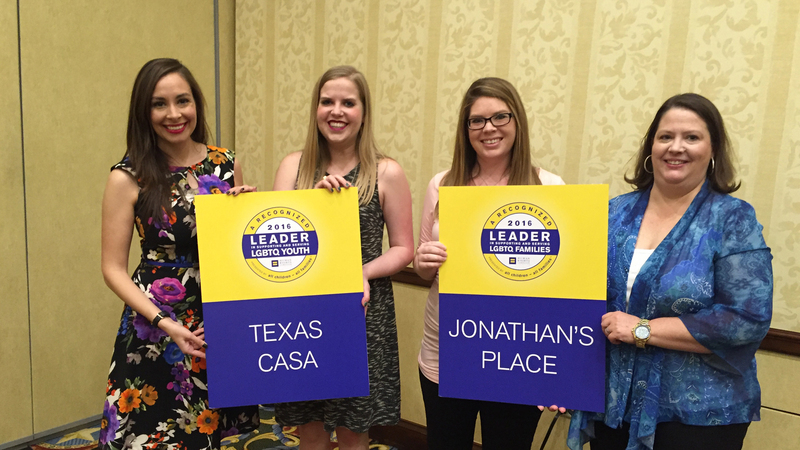 The two agencies, Texas Court Appointed Special Advocates (CASA) and Jonathan’s Place, were the first agencies in the state of Texas to receive the ACAF Seal of Recognition. Jonathan’s Place, which is based in the Dallas-area, works to provide safe, loving homes and specialized services to children who have been abused, abandoned or neglected. HRC Foundation’s ACAF initiative provides a comprehensive framework, from client non-discrimination policies to staff training, that assists agencies in establishing policies and practices that welcome, support and affirm LGBTQ youth and families. To learn more about All Children – All Families click here and to find LGBTQ-inclusive agencies in your area, check out the list of participating agencies.